As I consider straightening my workspace at home, my eye rests on two plastic bins full of legos. To me, legos are one of those eternally appealing toys worthy of keeping. So from my son’s growing up years we have a good collection. Gone are the instructions to make the space shuttle, the pirate cove, the jet ski. We have basic blocks in primary colors and we have mysterious specialized pieces- a flower, a pizza, a pulley, a blue windshield, a green antennae, an engine exhaust jet. Never more will these pieces assemble into the complex forms they were designed to make, but with imagination they will be roused from their sleep and become wonderful, original creations. Recently I sent a birthday package to Holly, our granddaughter. I enclosed a small big brother present for Jonah, because what four year old doesn’t need to be remembered by Grandma, as he sweetly suffers through someone else unwrapping all the presents? I sent him a small lego kit- to make a ninja on a motorcycle. It turns out he is just now able to follow the pictorial instructions on his own. Big news- Jonah put it together all by himself. And he loves ninjas. I see him in the birthday photos zooming it through their apartment. Once in a while you get it right, Grandma. Legos come to life. You connect the legos that remind you of your son to creativity and your grandson. Lots of memories there, I am sure. I remember when my oldest son put together his first lego creation using the directions. He was so proud, as I am sure Jonah was when he put together his motorcycle. Oh – legos. They are still very much a part of our life. I love that you’ve hit the present perfectly here, that legos come to life in so many ways. Who needs directions when one has a good imagination? Exploring is always more fun then following. How great that through today’s technology, you can see your grandson, miles away, loving his lego creation. And isn’t it a good feeling when the gift we’ve chosen is just right? Jonah is growing up so fast! Legos are one of those toys that withstand the test of time. I played with legos 50+ years ago, before they made the kits. 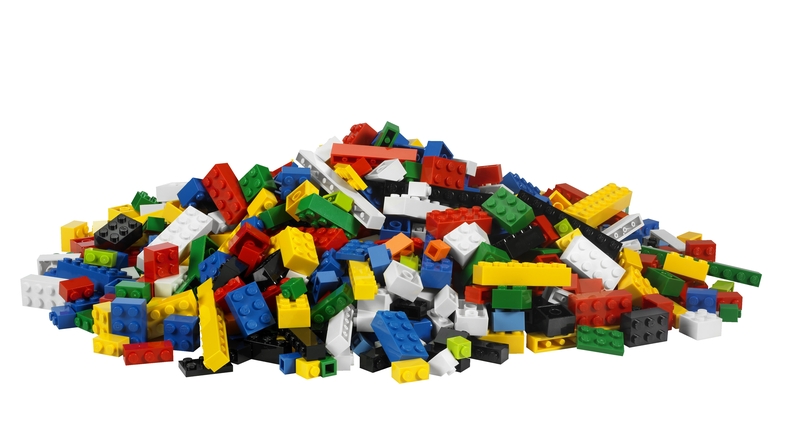 And I too have bins of legos in the basement, all mixed up, ready for my granddaughter to play with. We gave away our legos to a young LEGO lover but I think our adult sons and my husband would still like to put some together. Legos are definitely timeless! I love the picture you created by listing all of the random special pieces. Legos are timeless. The directions might be gone, but the building can go on forever. Who knows, someday your great grandson may create something with them.